High-school student Fujiwara Yumeji possesses the unusual ability to see other people's dreams. One day, he meets Merry who had wandered from the "Dream World" into the "Real World". This meeting raises many questions for Yumeji. Who exactly is Merry? What is the Dream World and what are Nightmares? What purpose do the Nightmares have for entering the Real World? On the boundary between the Real World and the Dream World, the duo's battle against the Nightmares begin! * Based on a light novel series written by Kimura Shin'ichi and illustrated by Kobuichi and Muririn. * Based on a manga by Tamura Ryuuhei, serialised in Shounen Jump. The story follows the strongest juvenile delinquent, Oga Tatsumi, he is a first year in Ishiyama High, the school for delinquents. The story starts as he is telling the story of how he found the baby to his best (and only) friend Furuichi Takayuki. One day while fishing by the river (actually, taking revenge on people trying to kill him in his sleep), he sees a man floating down it, he pulls him to shore and the man splits in half revealing a baby boy. This boy is the son of the demon king and he has been chosen as the one to raise it with the baby's maid Hilda. The story follows his life with the child and at the delinquent school. The early chapters of the manga follow Oga as he attempts to 'pass on' Baby Beel to other students at Ishiyama, (The theory is that if Oga can find someone more evil and stronger than him, Baby Beel will attached to that person instead of Oga). After subsequently fighting and defeating all members of the Touhoushinki and in the process, destroying Ishiyama High itself, Oga and company are transferred to Saint Ishiyama Academy, which appears to be a direct opposite of the delinquent school. Ryuuji, a high-school student, lives a quiet solitary life ever since his parents left to work abroad. However, his life is turned upside-down when Eriko re-enters his life. After being introduced to black market broker Fang, Ryuuji meets the enigmatic Rose. Although she may appear to be no more than a young foreign girl, she is actually a legendary Red Dragon! 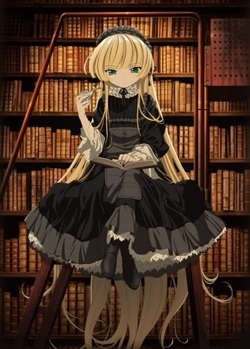 Gosick takes place in 1924 in a small, made-up European country of Sauville. The story centres on Kazuya Kujo, the third son of a Japanese Imperial soldier, who is a transfer student to St. Marguerite Academy, where urban legends and horror stories are all the rage. There he meets Victorique, a mysterious yet beautiful and brilliant girl who never comes to class and spends her days reading the entire content of the library or solving mysteries that even detectives can't solve. The series mostly focuses on Kazuya and Victorique getting involved in different mystery cases and their struggle to solve them, at the same time forming important bonds with different people. 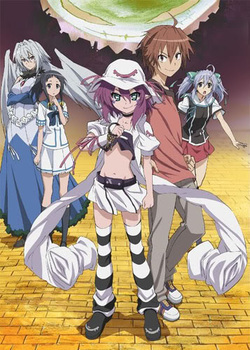 Set in a slightly futuristic world where Earth has been invaded and is at war with aliens from another dimension called the Nova, the story follows the adventures of a Japanese boy named Kazuya Aoi who enrolls for training at a special school for genetically modified girls called Pandoras who battle the aliens, and their male partners, called Limiters, who use a special power called "freezing" to limit their opponent's mobility. The protagonist makes the acquaintance of an unusual older girl named Satellizer L. Bridgette who appears to be the most powerful Pandora in her class, but has not yet chosen a male partner to be her Limiter, and in spite of the warnings of all his friends, he decides to be her Limiter.